. Funasshi ふなっしー Mascot from Funabashi, Chiba . Funabashi city is located in northwestern Chiba Prefecture and makes up one part of the Shimōsa Plateau. Funabashi is crossed by the Tone River, and the small Ebi River is located entirely within city limits. Funabashi formerly had wide, shallow beaches, but much of the coast has been industrialized and transformed by reclaimed land. 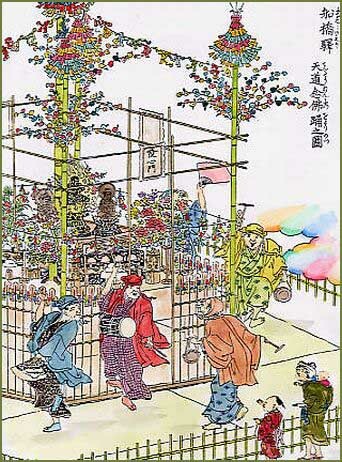 The name "Funabashi" is mentioned in the Kamakura period chronicle Azuma Kagami. However, the name itself is even more ancient, dating from before the Nara period and the Yamatotakeru mythology. Archaeologists have found stone tools from the Japanese Paleolithic period and shell middens from the Jomon period in the area, indicating continuous inhabitation for thousands of years. A number of Shinto shrines and Buddhist temples in the area claim to have been founded in the Nara period or Heian period. During the Muromachi periods, the area was controlled by the Chiba clan. During the Sengoku period, the Chiba clan fought the Satomi clan to the south, and the Late Hojo clan to the west. After the defeat of the Chiba clan, the area came within the control of Tokugawa Ieyasu. Under the Tokugawa shogunate, the area prospered as a post town on the river crossing of the Tone River, and was largely retained as tenryo 天領 under the direct control of the Shogunate and administered through a number of hatamoto. The area was also a favored hunting grounds for the Shogun. During the Boshin War of the Meiji Restoration, Funabashi was the location of a minor skirmish between Tokugawa loyalists under Enomoto Takeaki and the pro-Imperial forces of Okayama Domain and Satsuma Domain, during which most of the town burned down. After the abolition of the han system, the area eventually became part of Chiba Prefecture. Funabashi Town was one of several towns and villages created on April 1, 1889 under Inba District. The area developed rapidly due to its proximity to Tokyo and the presence of numerous military facilities in the area. On April 1, 1937, Funabashi was elevated to city status through merger with neighboring Katsushika Town and Yasakae, Hoden and Tsukada Villages. The new city was host to numerous military installations in World War II, and was bombed in the air raids on Japan in 1945. The city developed rapidly in the postwar period, with the development of industries, public housing developments and port facilities. With the annexation of neighboring Ninomiya Town in 1953, the population exceeded 100,000. The population exceeded 300,000 in 1969 and 500,000 in 1982. Funabashi was designated a core city on April 1, 2005 with increased local autonomy from the central government. The population exceeded 600,000 in 2006. ... Gyotoku, a settlement on the shore of Edo bay about 15 kilometers east of the city. To get there, we have to take a boat ride through the canals of Edo. As I have mentioned in the past, rivers and canals criss-cross most of downtown Edo, and one of the fastest ways to get from place to place is by boat. There are many piers and boat landings in the downtown part of the city, but today we are going to a pier that is used only by a special ferry boat operated by the city officials -- the water taxi to Gyotoku. Gyotoku is a very important site in this region, since it is the home of the Gyotoku salt works. Gyotoku kashi (Gyotoku wharf), located in the Nihonbashi district, is the starting point for a busy water taxi service . There are always boats preparing to land or depart, since there is a steady stream of townspeople travelling to and from the working-class suburbs east of the Sumida River. The wharf is named Gyotoku kashi after the town of Gyotoku, which is the last stop on the route. The watashi-bune (ferry-boats) follow one of several regular routes through the canals of Edo, but Gyotoku -- at the eastern end of Edo Bay -- is the final destination for all of them. 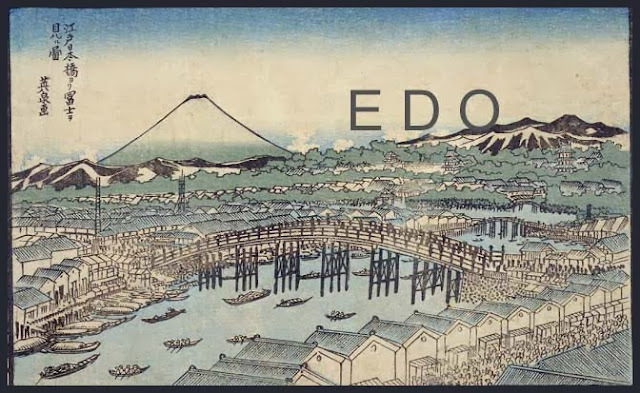 When Edo was first built, the flat marshy land on the east bank of the Sumida River was almost uninhabited. This low-lying land to the east of Edo was a marshy delta, formed by several large rivers that empty into Edo Bay. Even the isolated areas of solid ground in this area flooded easily during heavy rains, and there were few reliable sources of fresh water along the shore of the bay -- only when you went up-river beyond the high tide line could you get fresh water from the rivers. The marshes were a barrier that blocked traffic east from Edo. To get to the rich rice lands of Shimosa province you had to make a long detour to the north, along the Chiba Kaido, or else travel across Edo Bay by boat, rounding the marshes to the south and then swinging north again, up the coast to the towns of Gyotoku and Funabashi, which serve as the gateway to Shimosa province. One main canal, known as the Onagigawa (Onagi river), runs due east from the Sumida River near Nihonbashi to Gyotoku. This was one of the first canals to be built, though today, many other channels have been built, and the marshlands are crisscrossed by a checkerboard of canals. Once the canals were completed, transportation through the area became even smoother than travel by land. More and more people moved into the area as fresh water was made available, and today the area is a bustling neighborhood of blue-collar homes and small businesses. When the boat is full of passengers, the captain uses his long bamboo pole to push off from shore. The watashi-bune are generally driven by two boat pilots using long poles of bamboo. There is also a broad rudder on the stern of the boat, which can be used to propel the craft in places where the water is too deep for the poles to reach bottom. The boat travels down the canal from Nihonbashi to the Sumida River. When we reach the river the pilots slow down as they try to maneuver their way through the crowd of boat traffic. The Sumida river is Edo's main thoroughfare, carrying even more traffic than the Tokaido or any of the other main roads. The city is quite crowded and many of the streets are narrow, so it is hard to transport goods through the streets. Horse carts would be a nuisance to pedestrians, so they are hardly ever used in the downtown area. Instead, all goods are carried by boat to the nearest wharf, and then transported to their destination on the backs of nimpu (porters). The Sumida river is always thronged with boat traffic, and it is amazing to watch the boat pilots skillfully guiding their craft in and out of traffic. It seems amazing that there are so few collisions. The boat sails past the huge, arching span of Eitaibashi (Eitai Bridge). This towering bridge links the port districts of Nihonbashi, Minato and Tsukiji with the blue-collar neighborhood of Fukagawa. It is supported by several dozen huge columns, each carved from the trunk of a single huge hinoki (cypress) tree. The wood is highly resistant to water and rot, and it may last for as much as a hundred years before the bridge needs to be repaired. On the opposite shore of the Sumida river, just a short distance upriver from the bridge, is a broad waterway branching off from the main river channel. This is the Onagigawa (Onagi River　小名木川). The Onagigawa runs due east from the Sumida River, near Nihonbashi, to the Ara River, just a short distance from Gyotoku. The shoguns built this canal shortly after they moved to Edo, in order to provide quick and easy transportation between Edo and the rich provinces to the east. In addition to the constant stream of ferry boats, there are also many takase-bune (large cargo boats), which use the canal to carry loads of rice, vegetables and other agricultural products from the rich farms in Shimosa, Kazusa and Kotsuke Provinces. The Onagigawa cuts a wide path through the marshy lowlands to the east of Edo. There are many explanations for how the canal got its name. The characters O - NA - GI ("small", "name", "tree") do not make much sense unless they were a person's name -- perhaps this was the name of the person who oversaw construction of the canal. Another likely explanation is that the name was originally Unagi-gawa (eel river). The river is, in fact, filled with eels, and many unagi fishermen can be seen along the river, fishing for these delicacies. Perhaps the pronunciation changed over time, and people forgot the original source of the name. As our boat glides down this busy waterway, it passes through a series of small farming villages separated by occasional broad stretches of reeds and marshes. Before Edo was settled, this area of rivers and marshes was virtually uninhabited, but now it has become a thriving center of vegetable farming. Because of the rich soil, and the strong demand for vegetables from city dwellers, farmers in the towns along the Onagigawa have become quite prosperous. In fact, many varieties of vegetables take their names from farming communities in this area, such as Sunamura melons and Kasai leeks. However, as your boat moves further and further east, the small farming villages become fewer and more widely scattered, and the swamps and marshes broader and more filled with wildlife. The broad East-West canal continues onward through the marshes. Though there are few signs of habitation along the banks of the canal, boat traffic remains heavy. Your own boat continues to glide along the flat surface of the canal. The sun is rising higher into the sky, and the two boat pilots are sweating heavily as they propel the craft with their long poles. They seem to be poling more energetically now, since you have almost reached your destination. At last, the sparkling waters of Edo Bay come into view, and you can see the small but busy village of Gyotoku strung out along the shoreline. 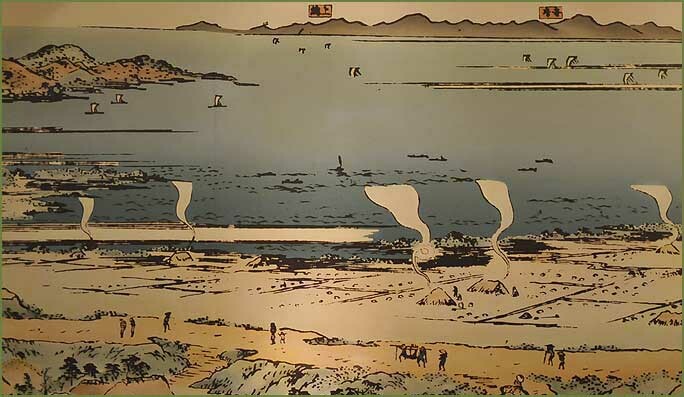 Clouds of steam rise from the low buildings along the canal, and on the flat land beside the bay, the sun sparkles off the salt fields, where salt is being produced for sale in Edo. Salt is a very important commercial commodity in most countries, and in Edo, the situation is no different. Salt is very important in the daily live of Edo's citizens for many reasons. In addition, people in Japan use salt in many rituals, as a symbol of purification. Priests throw salt on new building sites to purify them, and throw salt on the temple grounds for the same reason. When a person dies, the relatives throw salt outside the door of the house to keep evil spirits away. Merchants often put little piles of salt just outside their door to keep away bad luck. This is especially common at the beginning of the New Year. Finally, sumo wrestlers throw salt into the ring before they start wrestling, in order to purify the ring for the start of the match. The demand for salt is so great that the price is quite high in Edo. Merchants ship large loads of salt all the way from Western Japan. The best places to make salt are places with a long, flat beach that is fairly hard-packed, and which gets fairly large changes in the water level from high tide to low tide. There are many places like this along the Seto Inland Sea, in Western Japan, and these are the main centers of salt production. In the Edo area, though, Gyotoku is about the only good location in the area which has a beach that is wide enough and sandy enough to be suitable for producing salt. We have arrived at low tide and the sun is quite hot. 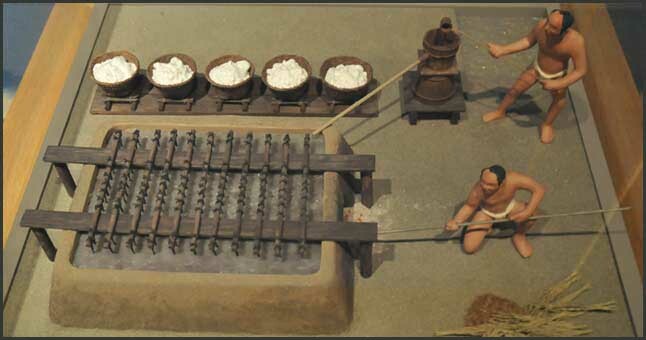 This is a good time to see the salt workers in action, since it is an ideal time for drying the salt. People are busily walking to-and-fro, carrying buckets on poles on their shoulders. There is a steady and constant traffic of people from the edge of the sea to the flat, hard-packed square fields that are laid out in a checkerboard across the wide, flat beach. The salt workers fill their buckets with sea water from a small channel that has been dug to bring the water a little ways up the beach, even at low tide. They then carry the buckets to the drying fields, where they pour the water into the field until a shallow layer covers the flat ground. The sea water is left to evaporate, and when all the water is gone, it leaves a crust salt. The workers will continue to add water a bit at a time and let it evaporate, continuing the process for as long as a week. After a few days of adding water again and again, then waiting for it to evaporate, there will be a thick crust of salt coating the field. This salt crust can then be raked up into piles and collected. the piles of salt are then stored in little storehouses until other workers can come by to collect it. The dried salt is then carried to the boiling houses further up the beach. A cluster of boiling houses is located not far from the salt fields; this is where the salt is processed and purified. Workers carry bundles of raw salt into the buildings, where it is carefully wrapped in very finely-woven silk cloth and then placed in a tub of water. The salt dissolves in the water, but the sand, dirt and grit that was mixed with the salt remains trapped inside the cloth. Finally, the supersaturated salt water is poured into huge boiling vats. 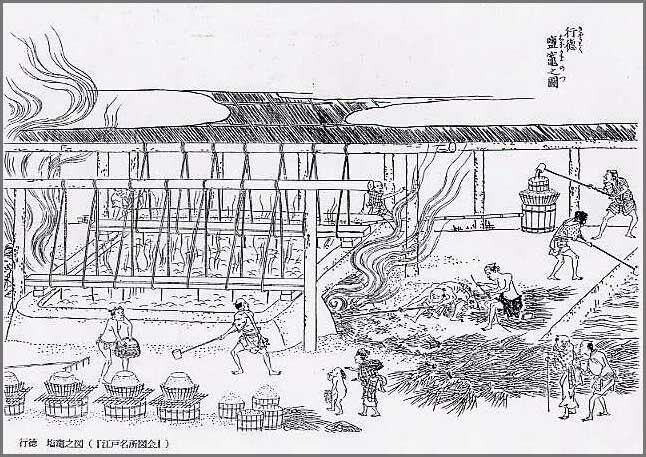 Fires built underneath the vats boil off all the water, and when the water is all gone, the salt that is left in the bottom of the vats is clean and pure enough to eat.
. enden　塩田 salt fields - Introduction . ever so softly . . .
. WKD : "lake butterfly", kochoo 胡蝶（こちょう） .
. densetsu 伝説　Japanese Legends - Introduction .